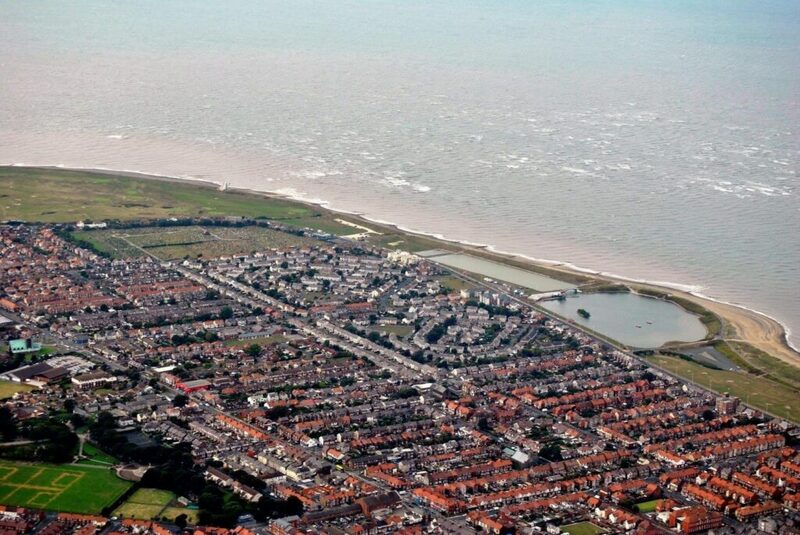 Fleetwood seafront and beach extends from Rossall Beach at Cleveleys. It follows the land peninsula into the estuary of the River Wyre, at the bottom end of Morecambe Bay. There’s the outer promenade, which is the footpath right along the edge of the beach. Plus the inner promenade which is the footpaths and spaces along the edge of the highway, that hugs the coast line in some places but not others. Fleetwood seafront has three different looks. 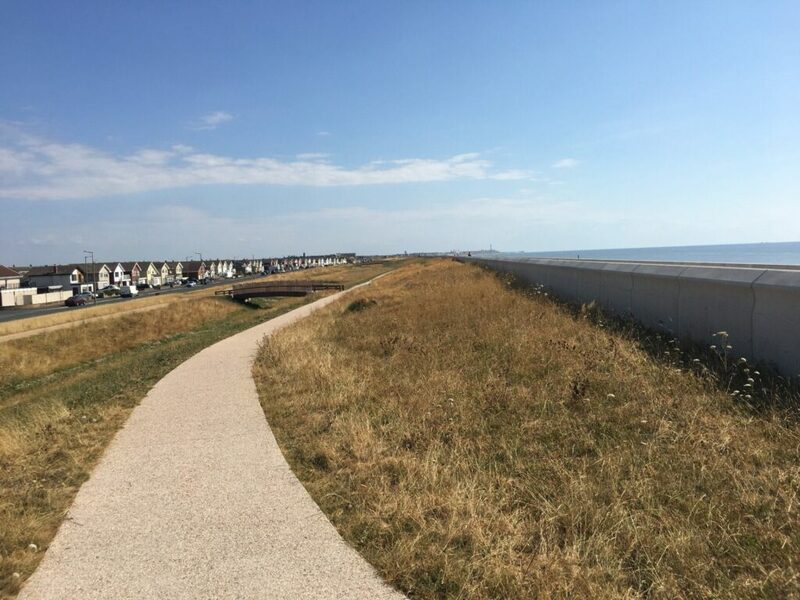 There’s the quiet, peaceful parts around the Rossall coastal defence scheme which opens up into dune systems, natural beaches and grasslands. Then the traditional seaside with ‘man-made’ features at The Esplanade and Marine Beach.  That’s the boating lakes and ponds, gardens, pitch and putt, lighthouses and seafront shops. 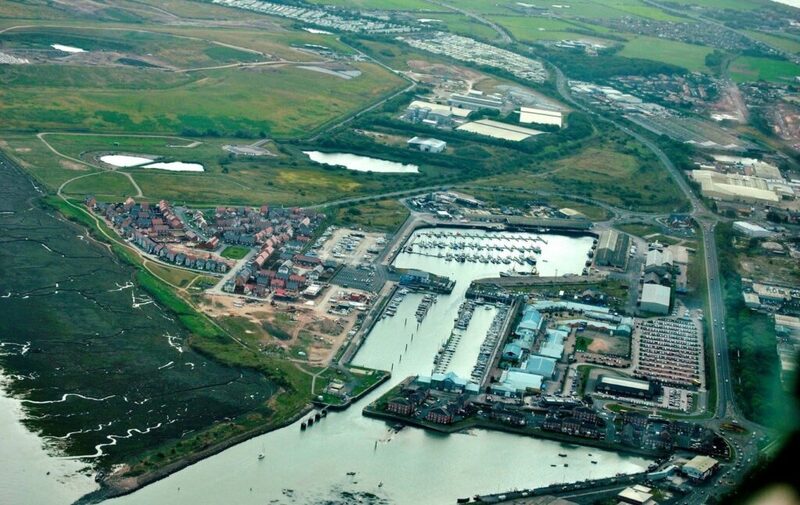 As the coast turns into the Wyre estuary, there’s the industrial area of the docks and finally, beyond the docks is the natural landscape of Fleetwood Marsh Nature Park. Many of the original Victorian features and architecture still exist. There are many heritage buildings like The Mount Pavilion and Fleetwood Museum. 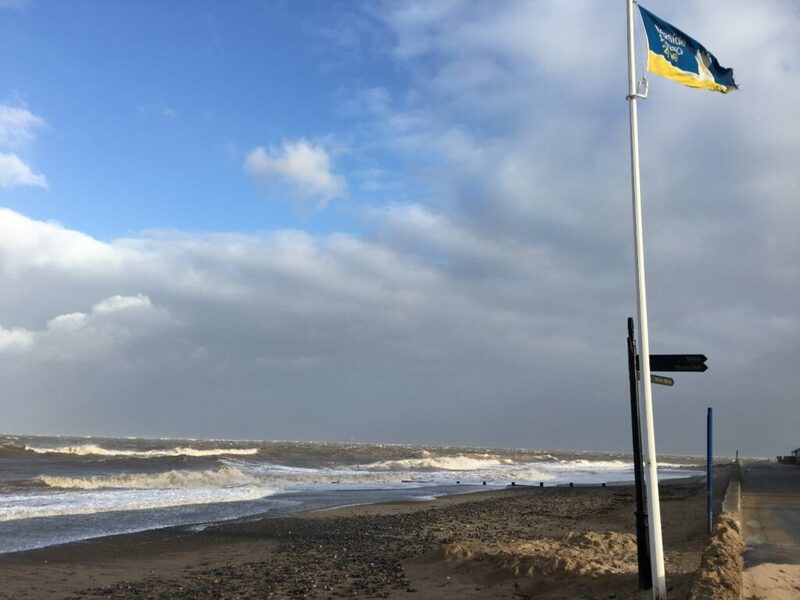 In this page, we leave Cleveleys in the south at Rossall School and carry on travelling north around the coastline with the beach and sea on your left. These clips were filmed while the sea defence works were in progress, so we need to get the dashcam rigged up and take new footage. Still an interesting look at the seafront though, over several videos. The first one covers the drive from Rossall Hospital at Westway, to the Sea Cadets base at the end of Beach Road. The shingle of Rossall Beach at Cleveleys gives way to old, tired seawalls in front of Rossall School. 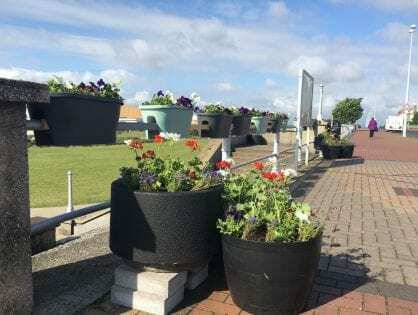 The highway also ends here, with a footpath taking you through the five bar gate at the very end of Rossall Promenade. Then head on foot past Rossall School. The tall concrete pillars here (below right) are known locally as the ‘tank traps’. Supposedly they were to stop invading troops from coming up the beach. They might have had a use in the war, but a more likely explanation is that they were built to protect the open air swimming pool. It once occupied the space in the field at Rossall School, behind the tall adjacent wall which you can see in the above photo. The old concrete walls fill the space between the five bar gate, and the new sea wall at Rossall. 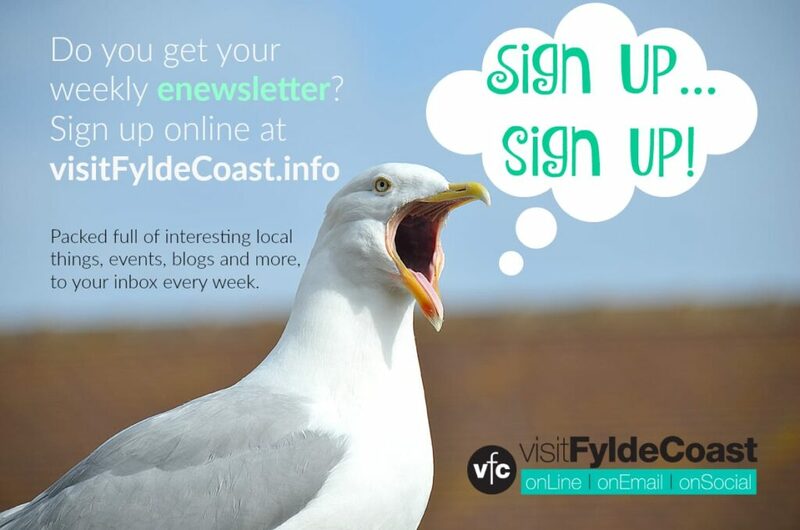 There isn’t actually a coast road which hugs the edge of the sea from Cleveleys to Fleetwood. You have to head slightly inland and drive around the land at Rossall School, parallel to the tram lines as far as the traffic lights at Westway. Turn left at Westway and head back to Fairway, the coastal road. Rossall Hospital (now a care home) is on your right. Behind it, on the corner of Westway, are new houses built where the original Rossall Hospital once stood. 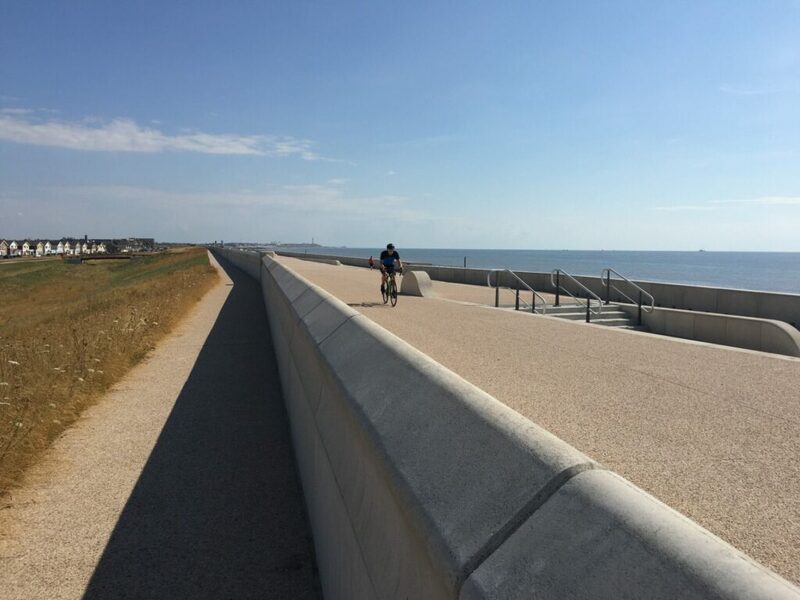 The Rossall Coastal Defence Scheme is a £63m project which was completed in 2018. 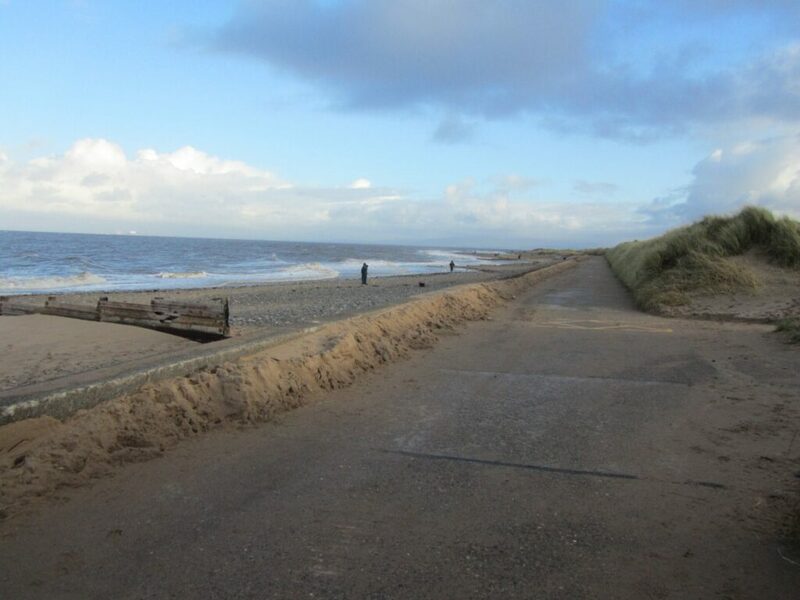 2km of new sea defences (just over a mile) have been built between Westway and Fleetwood Golf Course. It will protect 7,500 properties from the risk of flooding. It’s a huge piece of civil engineering – about twice as wide as the one it replaced. It’s built in three sections as it rises out of the beach. 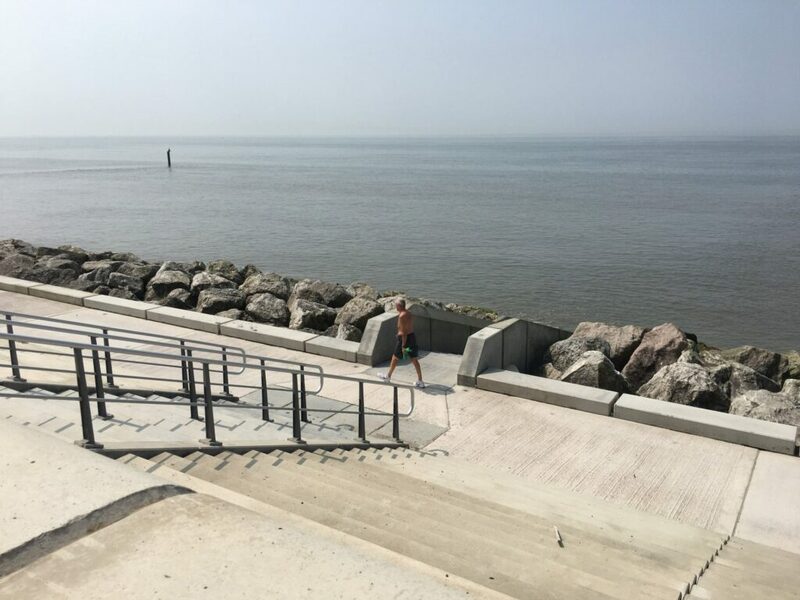 First, a rock revetment takes the majority of the abrasion from the sea, then a stepped sea defence offers a second line of protection. The wide promenade itself is split into two levels, with finally the rear flood wall. It’s an amazing public space, and so wide that it’s not easy to photograph! The grassy overflow land to the rear has been relandscaped into an ecology park. The overflow channel is still in place to collect any overtopping (particularly in later years) but now takes the form of a meandering stream. As a Biological Heritage Site the Larkholme Grasslands is an environment adapted to the harsh conditions, and home to a wide variety of wildlife. The Rossall Coastal Defence Scheme ends where Fleetwood Golf Course begins. Rossall Point is just what it sounds like, the place where the coast starts to turn eastwards at the end of the peninsula. Rossall Tower is at the right hand edge of the golf course. The land starts to turn away from the prevailing weather here, so a big, concrete sea defence isn’t needed. Instead, the sand and shingle beach provides the best kind of natural sea defences that there are. The footpath to the rear of the beach is backed with a small, natural dune system. The dune has grown over the years, created by grasses trapping the windblown sand. 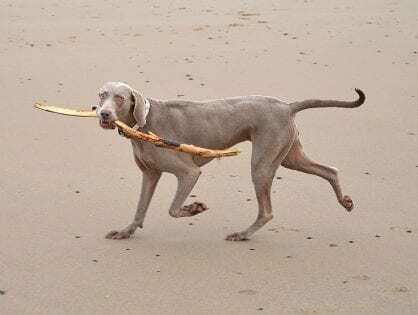 The beaches here are wide, open and wonderful to enjoy if you like peace and quiet, walking and seaside pastimes like fishing, horse riding and kite flying. 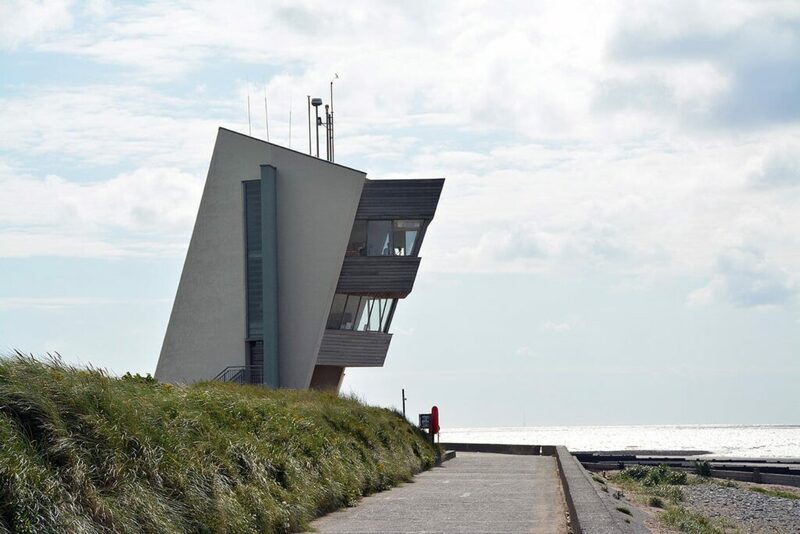 Designed to lean into the wind, Rossall Tower is a public building with a number of uses. The ground floor is an information point – pop in and have a look at leaflets and beach finds. The National Coastwatch Institute monitor the sands at our end of Morecambe Bay from the first floor. The top floor is an open observation deck. It’s well worth a climb to the top to take in the amazing view. To the north of Rossall Tower are public car parks, a children’s play area and the Log Cabin. There’s also a large open field where you can enjoy a picnic or a game of football. This is a popular spot and well used throughout the year for all manner of things, from walking the dog to having large family parties at the weekend. Our next clip picks up where the last one left off at the Sea Cadets at Beach Road. 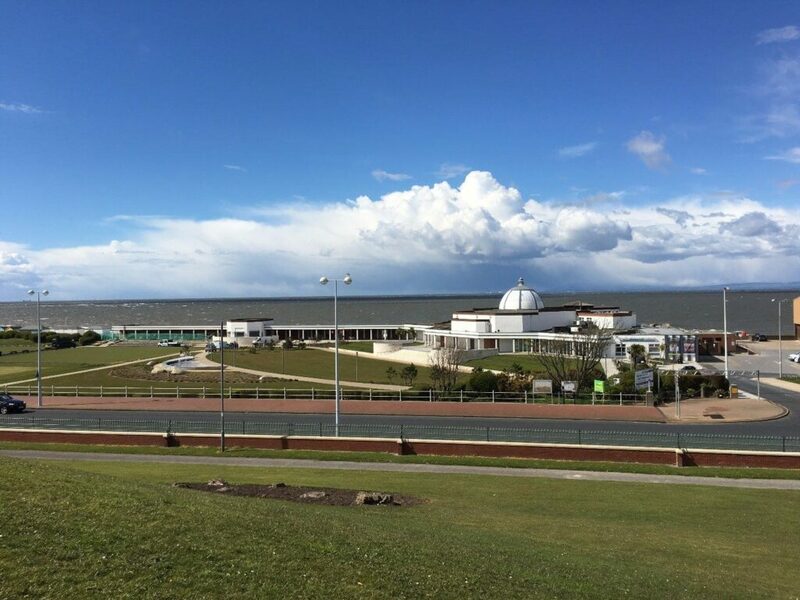 Travel along the ‘seasidey’ part of Fleetwood seafront to the Museum on Dock Street. Once you head north beyond the open green spaces of the golf course links you come to the boating lakes. 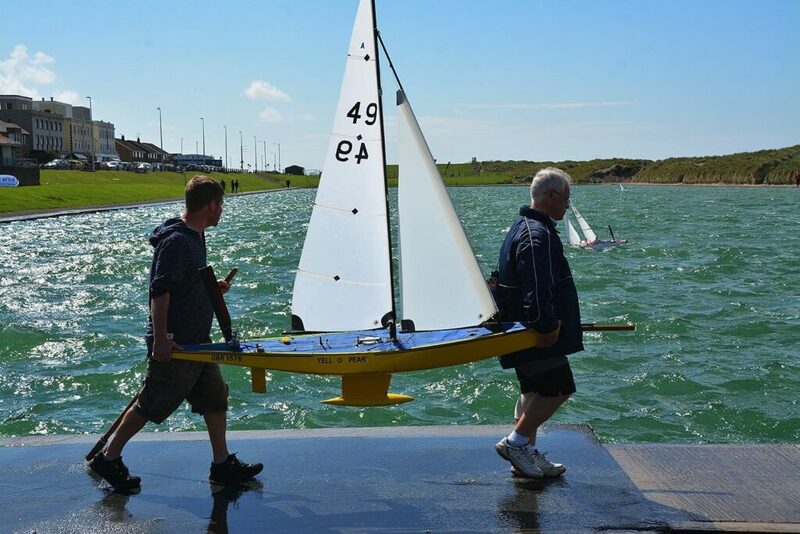 One is used for the model boat club who hold meetings, events and big competitions here. The other, larger one is used for canoeing and training. 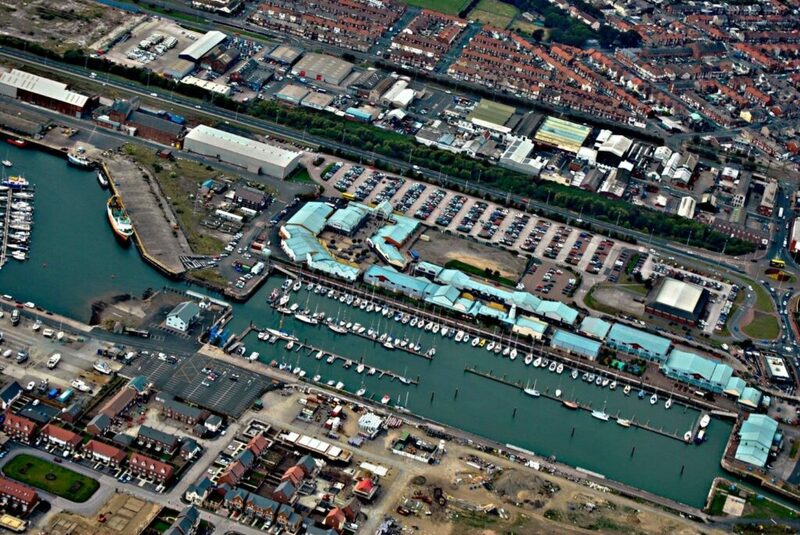 Blackpool and the Fylde College also use this larger boating lake for their nautical college students. The boating lakes are home to swans who have trained the public to come and feed them. The swans allow the model boat enthusiasts to use the smaller pond for their sport and competitions! Fleetwood seafront from the boating lakes to the docks retains its Victorian heritage and is really attractive, traditional British seaside. Beyond the boating lakes is a pitch and putt and rolling green grassy gardens. 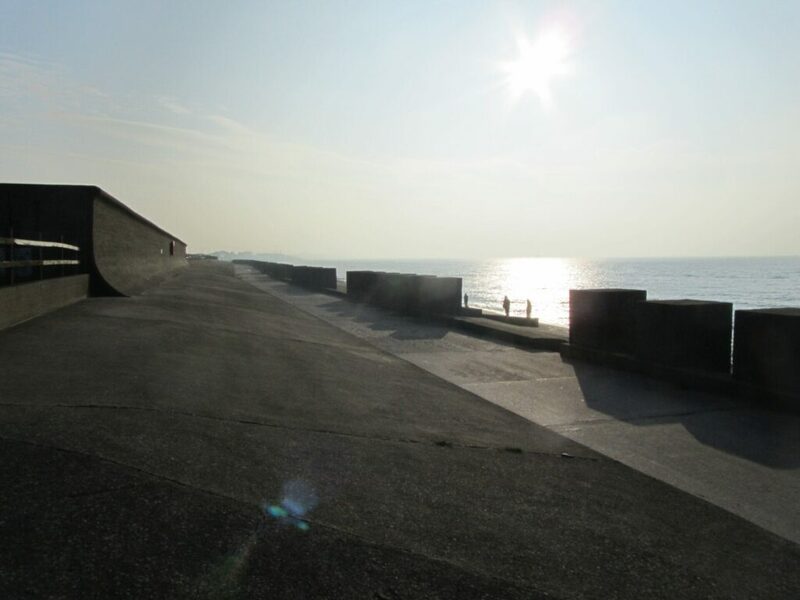 Walk the footpath along the length of the beach towards the seaside of the green open space, or use the promenade where you can sit and take in the view from one of the seafront shelters. Next stop on your journey is the Marine Hall. 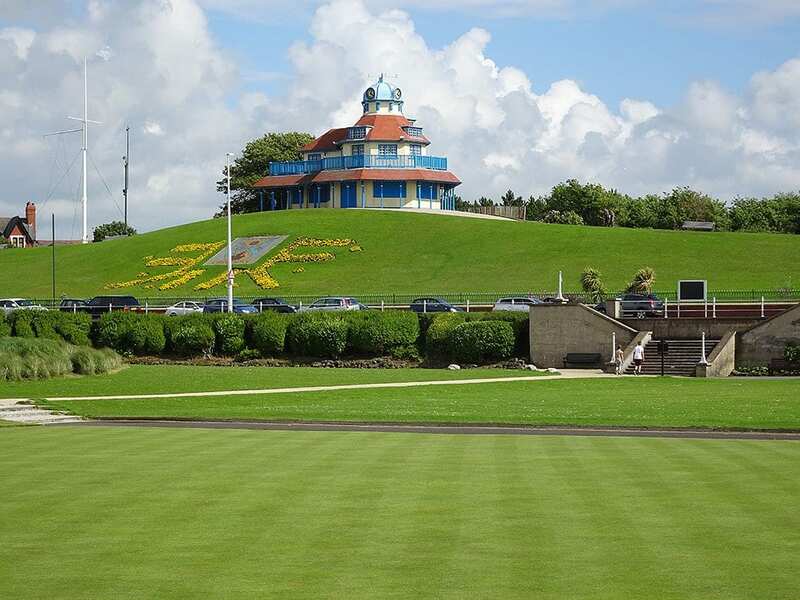 Indoors, it’s a multi-use function space while outside it’s surrounded by attractive gardens, beach huts and bowling greens. Next to the Marine Hall are the indoor sports facilities, with the swimming pool and sports hall, and plenty of free parking. 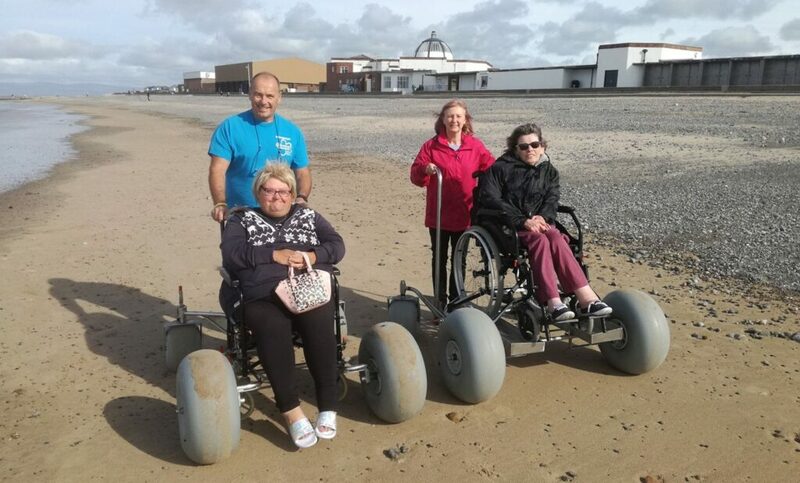 To the rear of the Marine Hall you’ll find the accessible, open, sandy Marine Beach. There are also facilities here like public toilets and cafes to make your day out on the beach more comfortable. 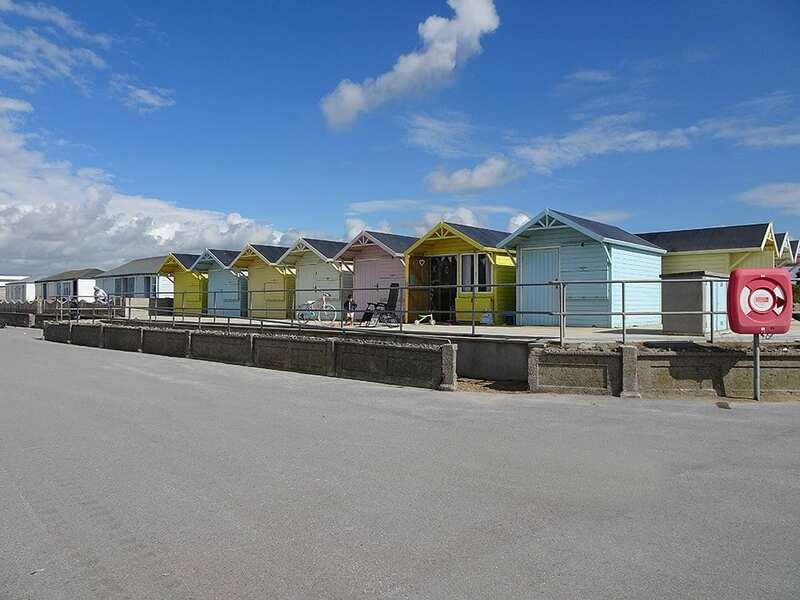 This area is also where you’ll find the beach huts. There are two different styles, the traditional pastel coloured ones and a modern design which are integrated into the colonnades of Marine Hall. 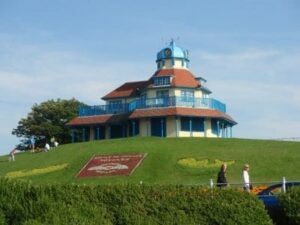 Opposite the Marine Hall is The Mount, with the Mount Pavilion at the top of The Mount itself whose public grounds are open to enjoy. Towards the rear (with protection from the prevailing wind) are park areas and a children’s playground. The gardens have recently been renovated with new features and planting to restore the original Victorian features of this well loved local landmark. 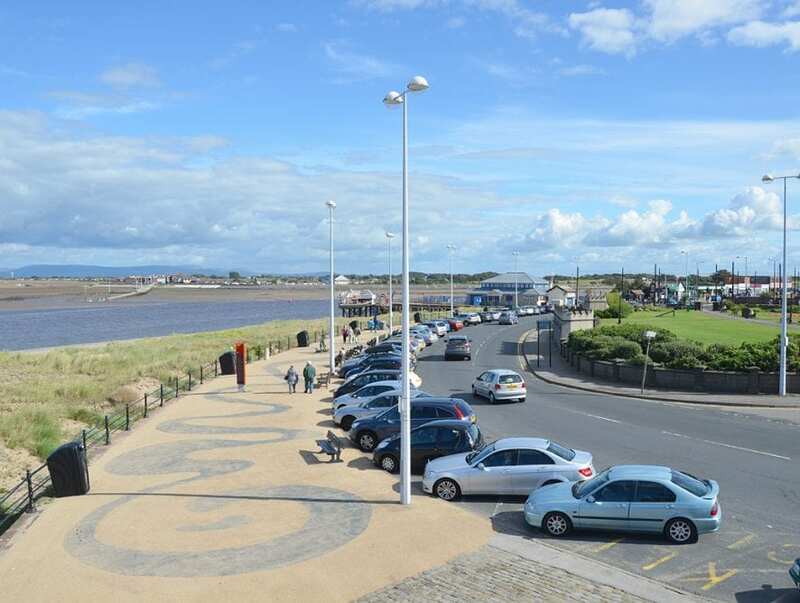 Next on the seafront at The Esplanade you’ll reach Ferry Beach, adjacent to Fleetwood RNLI lifeboat station. There’s free parking here, right next to the promenade, so you can sit in your car facing over the water. Two of Fleetwood’s three lighthouses are here. Can you spot the third one, out at sea? Look across the channel of the River Wyre to Knott End with Morecambe Bay, Heysham and the Lakes beyond. It’s a fabulous view for miles on a clear day. 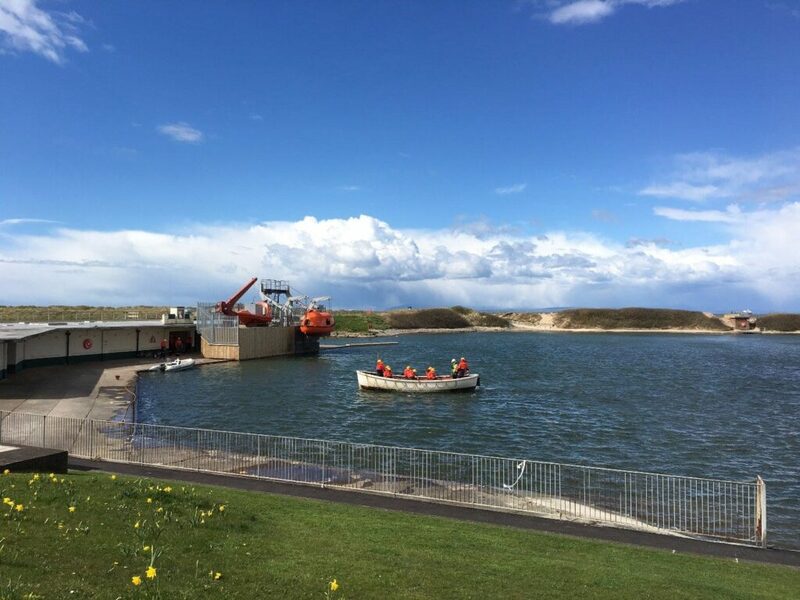 It’s also a site of Special Scientific Interest where you’ll see plants and native sea holly growing, they’re specially adapted to the harsh, salty sea air. In turn, the plants attract a wide variety of wildlife and birds. This is the old Victorian quarter of Fleetwood, with lots of old, architecturally important buildings. 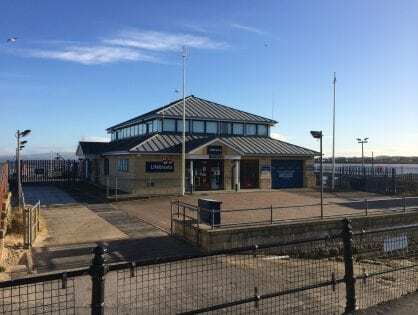 There’s the RNLI shop and boathouse, the Fleetwood to Knott End Ferry, and the shops and amusements at the seafront – all making up a traditional seaside scene. Behind you is the North Euston Hotel and Euston Gardens. 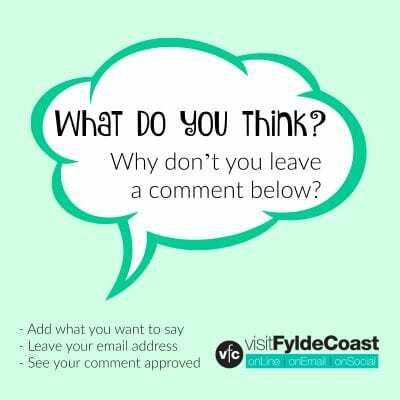 Our last video clip covers the journey from Fleetwood Museum to Eros roundabout on Amounderness Way. This is Dock Street. On the left is the disused land which was once the container parking for the ferry to Ireland. Eventually the brownfield site will be redeveloped. Until then it’s a useful car park each year for the thousands of people who visit for Tram Sunday. 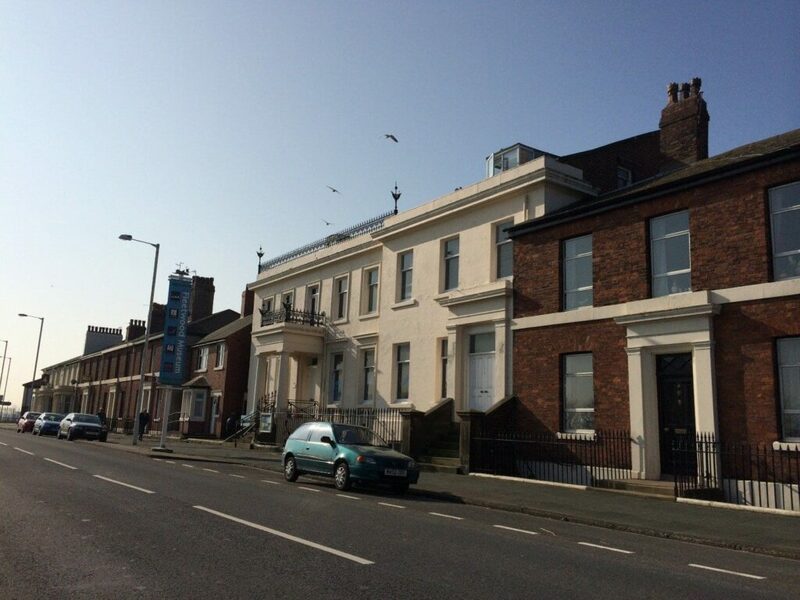 You’ll also pass Fleetwood Museum on your right, it was originally the old Customs House. There’s an eclectic mix of buildings along Dock Street. Fleetwood Railway Station was here, which is why Fleetwood grew in the first place. You can still see the splendour of some of these old buildings. Some are beautifully restored – thankfully a number of them still stand. There are spaces where others were demolished to make way for more modern buildings. Pick up the main A585 bypass road at Affinity Lancashire and it takes you the quick, straight route out of Fleetwood, first to Thornton. The next main roundabout you come to is Eros Roundabout. Turn left and then left again at Eros roundabout to find the vehicular entrance to Fleetwood Marsh Nature Park. 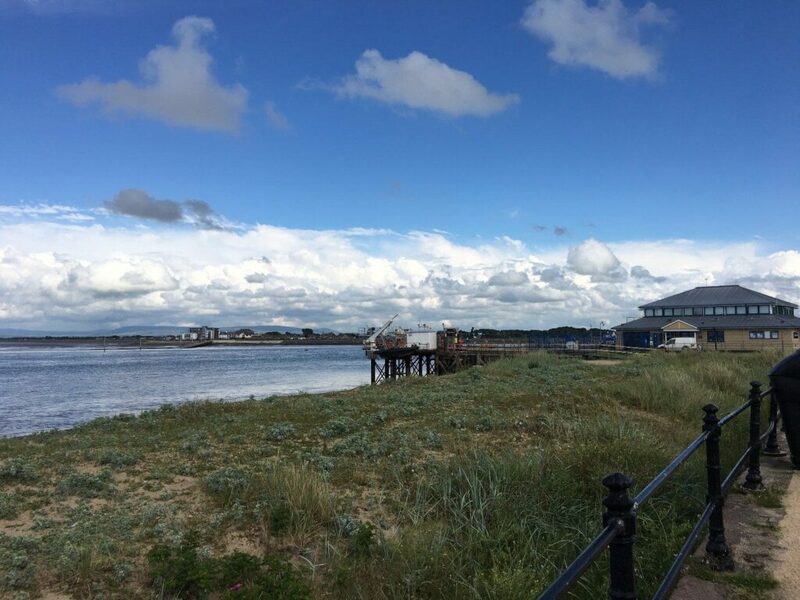 Fleetwood Marsh Nature Park is against the banks of the River Wyre, it’s accessed via Jamieson Road. See the small oval car park at the left of the pond in the centre of the next photo. See beautiful views and green landscapes as a reward for your efforts! Fleetwood Marsh is against the tidal banks of the River Wyre and is a rich habitat for an amazing variety of wildlife. It’s a great open space for walking and enjoyment of the outdoors. Abandoned boats lie against the edge of the river making a good subject for artists and photographers. Here’s the third of Juliette Gregson’s aerial photos from 2014. In it you can see the footpaths at the Nature Park, extending along the river bank behind the new housing estate to Affinity Lancashire. There’s now a footbridge across the harbour entrance.